The Hyundai Motor Company, commonly known as Hyundai Motors (Hangul: 현대자동차; Hanja: 現代自動車; RR: Hyeondae Jadongcha listen; Hangul: 현대; Hanja: 現代; MR: Hyŏndae, IPA: [hjə́ːndɛ], modernity; KRX: 005380), is a South Korean multinational automotive manufacturer headquartered in Seoul. The company was founded in 1967 and, along with its 32.8% owned subsidiary, Kia Motors, and its 100% owned luxury subsidiary Genesis Motor, altogether comprise the Hyundai Motor Group. It is the third largest vehicle manufacturer in the world. Chung Ju-Yung founded the Hyundai Engineering and Construction Company in 1947. Hyundai Motor Company was later established in 1967. The company's first model, the Cortina, was released in cooperation with Ford Motor Company in 1968. When Hyundai wanted to develop their own car, they hired George Turnbull in February 1974, the former Managing Director of Austin Morris at British Leyland. He in turn hired five other top British car engineers. They were Kenneth Barnett body design, engineers John Simpson and Edward Chapman, John Crosthwaite ex-BRM as chassis engineer and Peter Slater as chief development engineer. In 1975, the Pony, the first South Korean car, was released, with styling by Giorgio Giugiaro of ItalDesign and powertrain technology provided by Japan's Mitsubishi Motors. Exports began in the following year to Ecuador and soon thereafter to the Benelux countries. Hyundai entered the British market in 1982, selling 2993 cars in their first year there. In 1984, Hyundai began exporting the Pony to Canada, but not to the United States, as the Pony would not pass emissions standards there. Canadian sales greatly exceeded expectations, and it was at one point the top-selling car on the Canadian market. In 1985, the one millionth Hyundai car was built. In 2004, Hyundai was ranked second in "initial quality" in a survey/study by J.D. Power and Associates. [clarification needed] Hyundai is now one of the top 100 most valuable brands worldwide. [according to whom?] Since 2002, Hyundai has also been one of the worldwide official sponsors of the FIFA World Cup. Hyundai has six research and development centers, located in South Korea (three offices), Germany, Japan and India. Additionally, a center in California develops designs for the United States. In 1998, after a shake-up in the South Korean auto industry caused by overambitious expansion and the Asian financial crisis, Hyundai acquired the majority of rival Kia Motors. Hyundai owns 33.88% of Kia. Hyundai has invested in manufacturing plants in North America, India, the Czech Republic, Russia, China and Turkey as well as research and development centers in Europe, Asia, North America and the Pacific Rim. In 2004, Hyundai Motor Company had $57.2 billion in sales in South Korea making it the country's second largest corporation, or chaebol. Worldwide sales in 2005 reached 2,533,695 units, an 11 percent increase over the previous year. In 2011, Hyundai sold 4.05 million cars worldwide and the Hyundai Motor Group was the world's fourth largest automaker behind GM, Volkswagen and Toyota. Hyundai vehicles are sold in 193 countries through some 5,000 dealerships. Hyundai Genesis, named the 2009 North American Car of the Year. Hyundai Elantra, crowned North American Car of the Year at the 2012 Detroit Auto Show. Hyundai Tiburon, also known as the Tuscani in South Korea and as the Coupe in Great Britain, was discontinued in 2008. Hyundai Tucson, also known as ix35 in Europe and Brazil from second generation. In response, Hyundai began investing heavily in the quality, design, manufacturing, and long-term research of its vehicles. It added free maintenace for the first 2 years or 24,000 miles for all its new cars sold, starting with the 1992 model year. It also added a 10-year or 100,000-mile (160,000 km) powertrain warranty (known as the Hyundai Advantage) to its vehicles sold in the United States. By 2004, sales had dramatically increased, and the reputation of Hyundai cars improved. In 2004, Hyundai tied with Honda for initial brand quality in a survey/study from J.D. Power and Associates, for having 102 problems per 1000 vehicles. This made Hyundai second in the industry, only behind Toyota, for initial vehicle quality. The company continued this tradition by placing third overall in J.D. Power's 2006 Initial Quality Survey, behind only Porsche and Lexus. Hyundai is ranked number 4 in World's Most Admired Companies under the motor vehicles section of CNN, after BMW (Bayerische Motoren Werke), Volkswagen and Daimler in 2011. In 2008, at the North American International Auto Show, the production version of the luxury and performance-oriented Hyundai Genesis sedan made its debut, dealerships will have the Genesis as soon as summer 2008. In 2008, at the New York International Auto Show, Hyundai debuted its production version of the performance-oriented rear-drive Hyundai Genesis Coupe, slated to hit dealerships in early 2009. In 2009, four models from Hyundai and two from Kia, earned the Top Safety Award by the Insurance Institute for Highway Safety (IIHS). In 2009, according to a preliminary report from the Environmental Protection Agency published in November 2009, which is based on 2009 pre-model year production projections provided by automakers, Hyundai, at an average of 23.4 mpg‑US (10.1 L/100 km; 28.1 mpg‑imp), is the second most fuel-efficient automaker in America, after Honda's combined U.S. fleet of Honda and Acura models at an average of 23.6 mpg‑US (10.0 L/100 km; 28.3 mpg‑imp). Hyundai is the number one car brand by sales in Panama and Dominican Republic. Unit sales and year-on-year rate in China. From March 2017, unit sales plummeted in retaliation for the installation of THAAD. Hyundai cars, including those made by Hyundai's affiliate, Kia Motors, sold well in China until 2016, when sales fell by half, marking the start of a slump that continued into 2019, when the company announced plans to cut jobs in the region. Hyundai is currently working with its Chinese partner Beijing Automobile Industry Holding Co. to develop an electric car for sale only in China. In September 2011, it was announced that Korean celebrity Lee Min Ho, who is popular in China, will promote Hyundai's new 'Veloster' in China. Hyundai and its sister company, Kia, are losing market share because of their over-reliance on sedans, poor brand images and local Chinese automakers compete with price competitive SUVs. Hyundai Motor India Limited i s currently the second largest auto exporter from India. It is making India the global manufacturing base for small cars. In June, 2017, The Competition Commission of India imposed ₹87 crore ($13.6 million) penalty for unfair business practices with respect to providing discounts for cars. 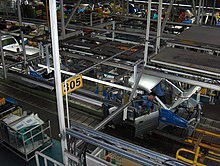 In September 1997, Hyundai opened a manufacturing plant in Turkey, located in İzmit, Kocaeli Province. The facility, named Hyundai Assan Otomotiv, was built as a 50-50% joint venture between the Hyundai Motor Company and the Kibar Holding of Turkey, the first stage investment raising to US$180 million. It currently has an annual production capacity of 125,000 units and it manufactured the Accent, the H-100, the Starex, the Matrix and since 2010, the i20. In May 2013 Hyundai Turkey Izmit plant capacity increased up to 200,000 units with 470 million Euro investment. The i10 and i20 are now produced here. In Russia, the production of the Hyundai Accent, Sonata, Elantra and Santa Fe models has been taking place at the TagAZ plant, located in Taganrog, since 2001, in the form of complete knock-down kits assembly. Since 2006, the factory has also been assembling the Hyundai Porter, County, Aero Town and the HD 500 commercial vehicles. Hyundai Motor Company began developing flexible-fuel vehicles (FFVs) in 1988. The test vehicle was 1991 MY Scoupe FFV. Since March, 1992, in Seoul, Korea, through at least November 1993, field trials of several FFVs had been performed over more than 30,000 miles. At the 2010 Geneva Motor Show, Hyundai unveiled the i-flow, a concept car using a variant of the BLUE-WILL hybrid system. The i-flow Concept uses a 1.7-liter twin-turbo diesel engine along with electric batteries to achieve fuel economy of 3 litres per 100 kilometres (94 mpg‑imp; 78 mpg‑US). Hyundai says a production car based on the i-flow's design will be in production by 2011. The Hyundai BlueOn is a subcompact five-door hatchback electric car produced by Hyundai Motor Company. The prototype, an electric version of i10, was first unveiled at the Frankfurt Motor Show in 2009. The pre-production testing model was unveiled in Seoul in September 2010, when the first of 30 units were delivered to South Korean government agencies for field testing. The carmaker planned to build 2,500 units by the end of 2012. The BlueOn is equipped with a LG 16.4 kWh lithium polymer (Li–Poly) battery pack and charges in 6 hours with a 220 V power outlet and in 25 minutes to 80% with three-phase electric power (in a 380 V outlet). The maximum speed is 130 km/h (81 mph) and 0–100 km/h is achieved in 13.1 seconds. According to Hyundai Motor Company, the total investment to develop the BlueOn, its first production electric car, was around 40 billion won (US$34.3 million). As of March 2014[update], cumulative global sales totaled 200 thousand hybrids, including both Hyundai Motors and Kia Motors hybrid models. After an investigation in 2012, the EPA found that 35% of all 2011-2013 Hyundai and Kia vehicles had inflated fuel economy numbers; by as much as six miles per gallon. Currently, Hyundai and Kia have started a reimbursement programme for the owners of the 2011-2013 affected vehicles. In 2014 the company was issued $350 million in penalties by the US government, agreed to pay $395 million in 2013 to resolve claims from vehicles owners, and agreed to pay $41.2 million to cover the "investigative costs" of 33 US state attorneys general. ^ a b c d e f "HYUNDAI MOTOR 2016 FAST FACTS". ^ "HYUNDAI MOTOR 2015 FAST FACTS" (PDF). hyundaiproductinformation.com/. ^ "worldpro2015" (PDF). Retrieved 2019-01-17. ^ "Hyundai ships 10 millionth car overseas". the korea herold. Retrieved 2016-03-31. ^ Steers, Richard M. (August 21, 2013). Made in Korea: Chung Ju Yung and the Rise of Hyundai. Routledge. ISBN 9781136600388 – via Google Books. ^ Fisher, Brian (1983-03-10). "Lotus, R-R & Co". Le Moniteur de l'Automobile (in French). 34 (764): 28. ^ "Chung Mong-koo". Business Week. Archived from the original on June 5, 2012. ^ "Explore Used Hyundai Models with Allen Turner Pre-Owned". Allen Turner Pre-Owned. Archived from the original on January 8, 2018. Retrieved January 8, 2018. ^ "수상내역 : 2004 - 기업정보 - 회사소개 | 현대자동차". HYUNDAI MOTORS (in Korean). Retrieved 2018-04-22. ^ "Hyundai research & development | Hyundai Motor Company". Worldwide.hyundai.com. 2010-06-10. Archived from the original on 2013-04-19. Retrieved 2011-04-24. ^ "Hyundai's augmented reality manual: A simple but extremely good idea". 2016. ^ "Kia Motors Shareholders". Kia Motors. Retrieved July 24, 2016. ^ "Hyundai Beats Ford, Becomes World's 4th Automaker". autoevolution. 2009-08-12. Retrieved 2010-09-20. ^ "Thomas Bürkle". Hyundai Motor UK Ltd. Archived from the original on 2013-10-02. Retrieved 2013-08-12. ^ "For Design". Archived from the original on June 17, 2015. Retrieved June 17, 2015. ^ "'Fluidic Sculpture' – Hyundai's Design Philosophy is Inspired by NATURE!". ReviewHyundai.com. March 22, 2013. Archived from the original on August 8, 2013. Retrieved August 12, 2013. ^ "Google Maps". Google Maps. Retrieved 2019-01-17. ^ "The 2007 Total Quality Award Winners". Strategic Vision. Archived from the original on July 16, 2011. Retrieved December 17, 2010. ^ "2009 North American Car of the Year". NACOTY. January 11, 2009. Archived from the original on February 3, 2014. ^ "Ward's 2009 10 Best Engines Winners". WARD'S. December 5, 2008. Archived from the original on September 26, 2011. Retrieved August 9, 2010. ^ "Light-Duty Automotive Technology, Carbon Dioxide Emissions, and Fuel Economy Trends: 1975 Through 2009". U.S. Environmental Protection Agency. 2016-05-04. ^ a b Tony Van Alphen (September 14, 2009). "Hyundai CEO wants Canadian car plant". The Toronto Star. Archived from the original on October 8, 2009. Retrieved May 4, 2010. ^ "Sobre a Hyundai CAOA do Brasil" (in Portuguese). Hyundai CAOA do Brasil. Retrieved 31 March 2016. ^ "Hyundai Motor to cut China jobs after sales slump". Reuters. 2019-01-25. Retrieved 2019-03-05. ^ "South Korea carmakers see China sales plummet further amid political tension - sources". Reuters. 4 May 2017. Retrieved 6 May 2017. ^ "BEIJING HYUNDAI OPENS NEW PLANT, ADDS NEW MODEL" (Press release). Hyundai. Archived from the original on July 12, 2011. Retrieved January 28, 2011. ^ "HYUNDAI REVEALS THREE NEW MODELS AT SHANGHAI AUTO SHOW" (Press release). Hyundai. Archived from the original on July 12, 2011. Retrieved January 28, 2011. ^ "OSEN - 현대·기아차, 中 누적 생산·판매 700만 대 돌파". Retrieved June 17, 2015. ^ "Huatai-Hyundai and Roewe hook up to stick 1.8T in SanteFe". China Car Times. 2007-10-11. Archived from the original on April 1, 2012. ^ Correspondent, Special. "Hyundai plans to enter three new segments". The Hindu. Retrieved 2017-03-09. ^ PTI. "Hyundai decides to pull the plug on i10". The Hindu. Retrieved 2017-03-09. ^ "2017 Hyundai Grand i10 facelift ready for launch". The Hindu. Retrieved 2017-03-09. ^ "Competition Commission slaps Rs 87 crore fine on Hyundai Motor India". The Times of India. June 14, 2017. ^ a b "Why Hyundai Failed to Conquer Japan". ^ "증설공사 마무리단계 현대차 터키공장 가보니." 2013-04-18. Retrieved June 17, 2015. ^ Linsu Kim (1998). "Crisis Construction and Organisational Learning: Capability Building in Catching-up at Hyundai Motor". Organisation Science, Vol. 9, No. 4, July–August 1998. 9 (4): 506–521. CiteSeerX 10.1.1.137.2033. doi:10.1287/orsc.9.4.506. Retrieved 6 April 2013. ^ "New European Hyundai Motor Headquarters in Rüsselsheim". Presseportal. September 8, 2003. Archived from the original on May 21, 2013. Retrieved April 7, 2013. ^ Agence France-Presse (January 25, 2006). "Hyundai Considers Czech Auto Plant". IndustryWeek. Archived from the original on July 13, 2011. Retrieved December 12, 2009. ^ a b "Модельный ряд" [Model line-up]. TagAZ. Retrieved 14 April 2013. ^ "Под Петербургом началось строительство завода Hyundai" [Near St. Petersburg the construction of the Hyundai plant began] (in Russian). Motor.ru. 5 June 2008. Retrieved 14 April 2013. ^ "HYUNDAI AMONG LEADERS IN DEVELOPMENT OF ENVIRONMENTALLY FRIENDLY VEHICLES FOR THE 21ST CENTURY". Hyundai News. November 1, 2000. Archived from the original on July 3, 2013. Retrieved December 29, 2012. ^ a b c "Hyundai's Clean Green Machine: The TB HEV (Hybrid Electric Vehicle)". Hyundai News. October 31, 2003. Archived from the original on July 3, 2013. Retrieved December 28, 2012. ^ "Hyundai Elantra LPi hybrid official press release". Hyundai. July 10, 2009. Archived from the original on July 17, 2009. Retrieved March 23, 2010. ^ "Hyundai to Green Mongolian Desert" Archived April 3, 2016, at the Wayback Machine. Korean Times. (2008-04-24). Retrieved 2008-05-18. ^ "Hyundai's Getting Dirty". Blog.roadandtrack.com. February 4, 2011. Archived from the original on February 9, 2011. Retrieved April 24, 2011. ^ Evans, David (17 December 2012). "Hyundai World Rally Car makes European test debut". Autosport.com. Haymarket Publications. Retrieved 17 December 2012. ^ Evans, David (27 September 2012). "Hyundai reveals new i20 World Rally Car". Autosport.com. Haymarket Publications. Retrieved 27 September 2012. ^ Evans, David (19 December 2012). "Hyundai's early WRC effort was more than just a show car". Motorsport News. ^ "Automotive Engineering International Online: Global Vehicle Development: Part III Asia". Sae.org. Archived from the original on June 5, 2011. Retrieved December 17, 2010. ^ "Hyundai Unveils 'Walking Car' That Could Be the Future of Search-and-Rescue Missions". Geek.com. 2019-01-08. Retrieved 2019-01-08. ^ "live brilliant". Archived from the original on June 17, 2015. Retrieved June 17, 2015. ^ Hyundai-Blog. "Live Brilliant". Archived from the original on June 17, 2015. Retrieved June 17, 2015. ^ "Articles - Best Global Brands - Interbrand". Archived from the original on September 17, 2014. Retrieved June 17, 2015. ^ "Hyundai announces official NFL automotive sponsorship". ^ Park, Si-soo (August 15, 2014). "Pope Francis bestows halo on Hyundai-Kia". The Korea Times. Archived from the original on August 19, 2014. Retrieved June 5, 2014. ^ Shepardson, David (27 October 2016). "Hyundai, Kia to pay $41.2 million to U.S. states over mileage claims". Reuters. Retrieved 12 March 2018. ^ "A polêmica do Veloster: 140 ou 128 cv?". Revista Quatro Rodas. October 28, 2011. Archived from the original on August 22, 2014. Retrieved August 21, 2014. ^ "Veloster entra no dinamômetro e tem rendimento abaixo do anunciado". UOL Carros. January 31, 2012. Archived from the original on September 4, 2014. Retrieved August 21, 2014.